This care sheet is for beginners and covers the basic maintenance of this group of pythons. You should join your local herpetological society, where you can meet others and obtain more detailed information on the keeping of these pythons. The term "childrens python" is used to describe a group of small, rock dwelling pythons known as Childrens Python (Antaresia Childreni), Small Blotched Pythons (Antaresia Maculosa) and Large Blotched Pythons or Stimsons Python (Antaresia Stimsoni). Contrary to popular belief these pythons are not known as Children Python because it is the snake for children but because Antaresia Childreni was named after Mr. J.G. Children, an English naturalist. 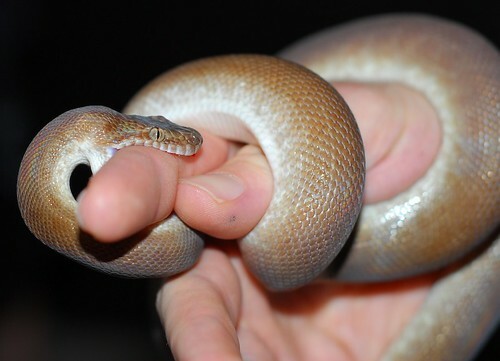 The Eastern Small Blotched Python and Childrens Python are most commonly bred by reptile keepers and hence most readily available, although Stimsons Python is also sometimes available. Childrens python need to be kept indoors. An aquarium with a close fitting and secure lid is the simplest type of cage. Wooden cages with glass fronts retain heat better and are preferred by some keepers. Remember that snakes are expert at escaping and can squeeze through very small spaces, so you must make quite sure there are no gaps or holes. Small snakes do not need big cages. One or two adult Childrens Python can be housed in a 1 meter long cage which is 40 to 60 centimeter wide. Hatchlings can be kept in smaller cages or plastic containers 30cm x 20cm and be moved to larger cages as they grow. The bottom of the cage can be covered with aquarium gravel, coarse sand, leaf litter or bark. Some keepers just put down newspaper or butchers paper. Whatever material is used must be kept dry and clear. Faeces must be removed promptly and the floor covering material replaced it it gets damp or soiled, and certainly completely changed every few months. Cage furniture should be kept to minimum. A stable water dish is essential and should be of a type that the snake cannot push under and spill the water. A suitable hiding place for each snake is also essential. This can be a cardboard box which provides a snug fit for the snake. Even curled pieces of bark under which the snake can curl are suitable. Plants, rocks, logs, etc. are optional. They can be dangerous for the animal if not secure, and they can make it difficult to retrieve and remove the snake from the cage safely. The more the cage is cluttered up, the more it takes time to clean and the greater the risk of accidents. Childrens pythons are nocturnal although they will come out during the day. If the cage is situated in a room that gets plenty of sunlight then the lighting in the cage is mainly to provide heat. A word of caution, do not place cage in direct sunlight as temperatures within the cage could reach lethal levels. It takes only a few minutes for a snake to die from overheating. As incandescent globes give off heat, these can be used to raise the temperature in the cage which should provide a range of temperatures so that the snake can move to a warmer or cooler spot as it wishes. The temperature range should be from about 35 to 25 degree Celsius and can be accomplished by placing the light source at one end of the cage to create a hot spot and by the use of heating devices such as hot rocks, heating pads or heat strips. A thermometer must be used to check the temperature levels in the cage until these are stabilized. Don't try and guess the temperature. Adults can be fed every 10 to 14 days. One fully grown mouse will usually be sufficient. Juveniles should be fed at least weekly starting off on one or two new born "pinkie" mice and progressing to larger mice as they grow. Hatchlings that are reluctant to take mice can usually be encouraged to do so by washing and drying the mouse to reduce the mouse scent. Another method is to scent the mouse by rubbing it with a lizard. It is not necessary to feed live animals to snakes. Almost all snakes will take dead mice, either freshly killed or thawed frozen mice. It might be necessary for the first couple of feeds to wriggle the mouse around a bit to get the snakes attention. Frozen mice must be completely thawed out before being offered to the snake and if not eaten must be discarded. Do not refreeze mice that have been defrosted. Further Reading on Childrens Python.